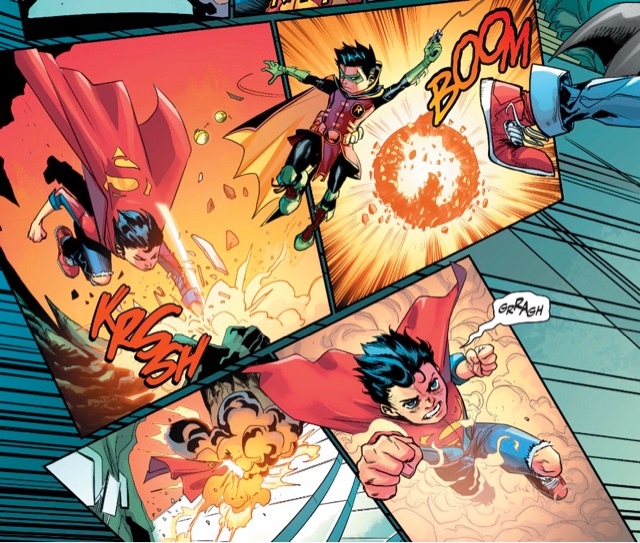 Damian Wayne and Jon Kent triumphed in their first big adventure together, beating the deadly Kid Amazon. And now they're grounded. 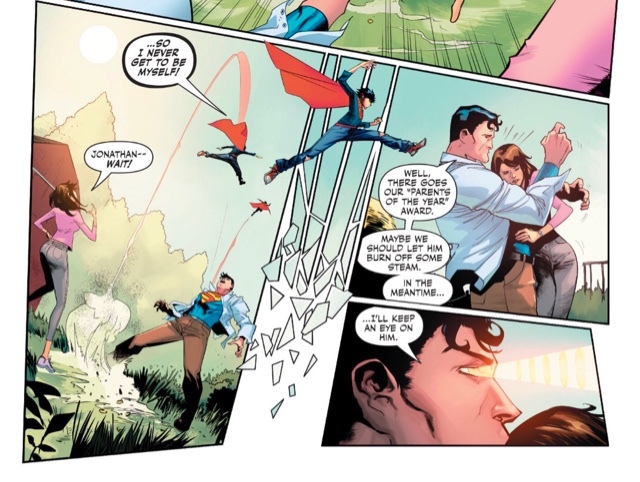 Batman, Superman and Lois may be proud of their super-sons but they're little kids - should they really be shooting off on their own, annoying the likes of Lex Luthor? ... and Jon is doing chores. 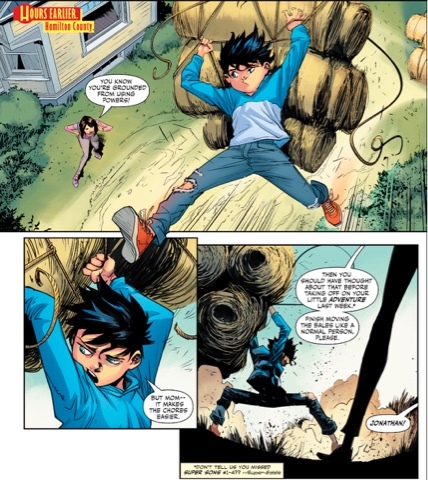 Worse yet for the new Superboy, he's about to be uprooted from his rural home of Hamilton to crowded Metropolis, where he's unlikely to be free to have fun with his growing powers. Cue tantrum. 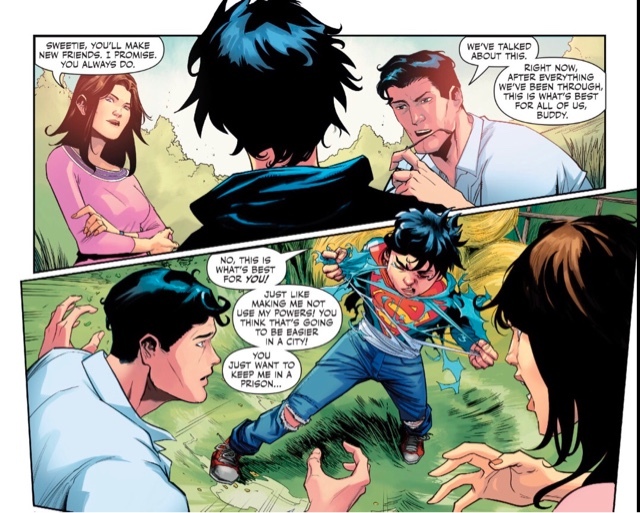 Blaming Damian for dragging him into trouble - basically true - Jon heads for the Batcave, though by the time he arrives he's more inclined to share, than fight. 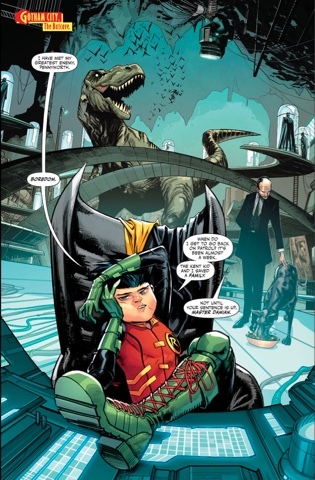 Unfortunately, Damian's default is to ridicule and belittle and... well, how he's gotten to 13 without being pushed into a deep, dark pit is anybody's guess. And so it is that Boy Wonder and Boy of Steel embark on a tussle that threatens to butcher the Batcave. If you think that's going to attract some adult attention, you'd be correct; the arrival of, first, Alfred, and then Batman and Superman, brings lectures, lessons and license to get out and have adventures. Well, Jon and Damian have already proved they're not going to sit at home and play tiddlywinks, may as well give them permission to practice being heroes... but let them know they're being watched, lay down some ground rules. While I've enjoyed this series so far, I wasn't expecting an issue advertised as one big fight to be quite so good. Oh me of little faith! 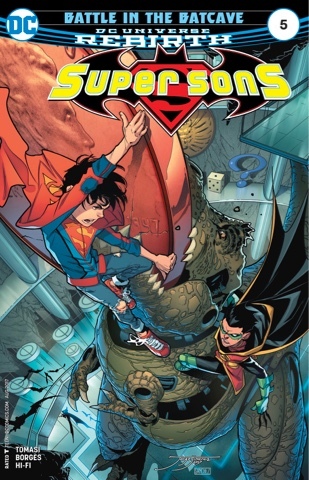 Writer Peter J Tomasi continued his pitch perfect characterisation of Damian - arrogant, irritating but far from irredeemable... he says he and Jon aren't friends, but is quick to offer him a hideout when Superman comes calling. Jon, meanwhile, is cast in the role of straight arrow, but he's no patsy and calls Damian on his guano. He also gets to narrate some of the issue for, I think, the first time. 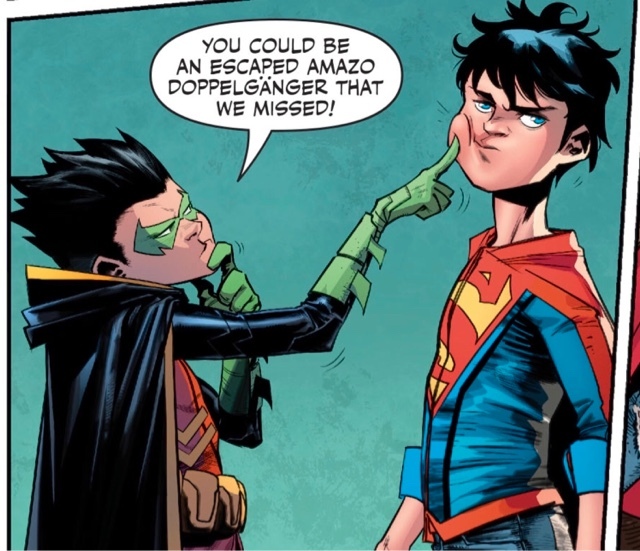 This issue is the logical next step in the relationship of Jon and Damian, placing their growing friendship in a family context and ensuring this comic isn't about two kids constantly at odds with one another. 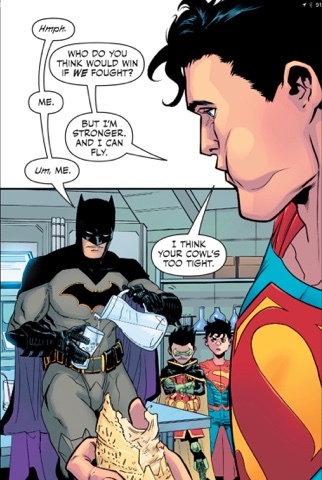 Plus, Tomasi consistently provides delightfully funny dialogue. Regular artist Jorge Jimenez provides the mass market cover, with colourist Alejandro Sanchez, but the interior art is the work of Alisson Borges, who recently handled DC's Raven mini-series. He again shows a talent for capturing the body language of children, along with facial expressions unfettered by adult guile. He's great with the grown-ups too. There's a pleasing dynamism, imaginative panel work - check out that fracturing of the page in the tantrum scene - and fluidity of movement. I hope Borges is the regular number two artist on this series. Dustin Nguyen's variant cover is, as ever, a treat, while colourist Hi-Fi and letterer Rob Leigh (the man who remembers 'doppelgänger' takes an umlaut) provide their usual quality work. 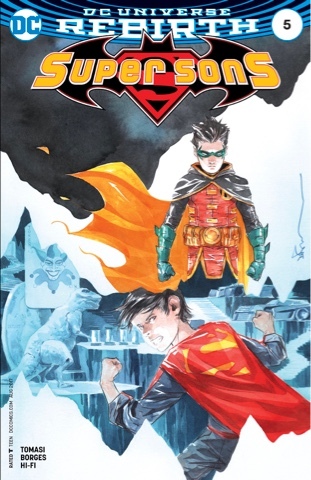 Damian Wayne is, it's safe to say, the Marmite of the superhero set - Jason Todd was never so annoying, and he got bashed to death by the Joker - but if you do enjoy him, or can can cut him some slack, you'll likely love this done-in-one. Tomasi really is great at character and relationships, isn't he?